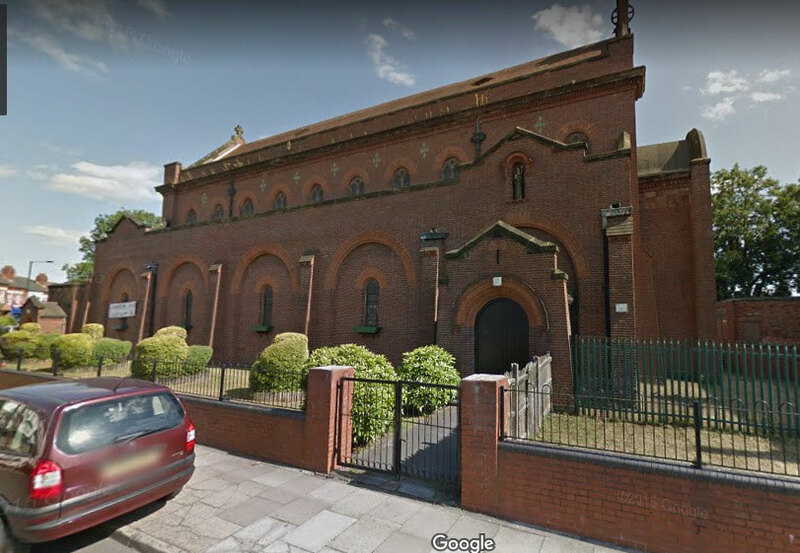 Opened in Holman Road in 1898, St Benedict's began life as a temporary iron church, a mission of St Oswald's, Bordesley. The iron church was replaced in 1905 by the present building on Hob Moor Road, designed by Nicol & Nico. It is of red brick with sandstone dressings in Romanesque style, with an apsidal chancel, side chapel, nave, north and south aisles and a west bellcot. The new church was consecrated in 1910 with a parish was assigned out of St Oswald's. There is an unusual Byzantine-style painting in the chancel depicting Christ in Majesty with angels and saints in the arcading below. It was painted by pre-Raphaelite artist Henry Holiday in 1912. Historic England website - https://historicengland.org.uk/listing/the-list/list-entry/1076300. See A Church near You - https://www.achurchnearyou.com/church/7324/.